Any investigation of racial anti-Semitism in Europe during the second quarter of the twentieth century inevitably has to come to terms with what is probably the most intractable and most controversial of historical debates, that relating to the Holocaust. The recent libel action by the British historian David Irving, a ‘Holocaust denier’, against Deborah Lipstadt, is just one example of the way in which the issue of the mass killing of the Jews continues to arouse heated controversy, and to impact on contemporary ideological and political issues. A single chapter cannot possibly do more than to touch upon this immense and complex field: the approach taken here is to be deliberately selective and to present a particular interpretation, without giving full space to the countervailing arguments or theories. 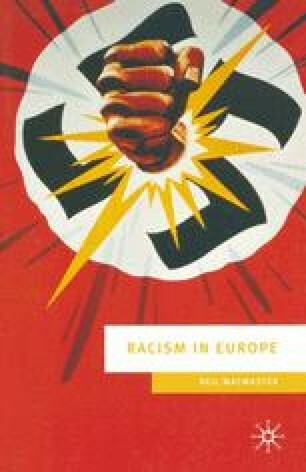 Inevitably, attention will focus on Germany as the epicentre of state racism, a genocidal strategy that was ‘exported’ to most of Continental Europe by the Third Reich. The structure of German anti-Semitic ideology is explored through Hitler’s Mein Kampf, a typical ‘populist’ summation of inter-war racism.